Farkas is a Nord and member of the Companions. While, as his twin brother Vilkas puts it, "his brains are not his strong suit", Farkas is respected as a skilled warrior. He and Vilkas belong to the Companions' inner circle and, as such, are both werewolves. Farkas appears morally ambivalent about being a werewolf, and is hesitant to use his Beast Form. He can be loose with his tongue, often showing impertinence to his elders. However, he warms up quickly to you when met, and is quick to protect his friends. He wears a random set of steel armor and is armed with a skyforge steel greatsword (or an iron greatsword at lower levels). He also carries a belted tunic and the key to the Whiterun gate. He offers both miscellaneous quests and master level training in Heavy Armor. During the journey to Ysgramor's Tomb, Farkas will refuse to accompany you past the outer chambers, admitting that he has developed a fear of giant spiders following your initiation trial in the quest Proving Honor. If you ask who the Companions are, he tells you: "The Companions are my family. We fight so that other people don't have to. We bring honor and glory to ourselves and each other." If asked why he joined, he will say: "Vilkas and I have been here since we were little whelps. Our father, Jergen, raised us here. Even Vignar couldn't remember Companions younger than us!" When questioned on what it means to be a Companion, he responds: "I've never been a smart one. But the Companions welcome anyone with the heart of a warrior. When we step into battle, we fight for our own name, and the name of the Companions." If asked where he stands on the current war, he will state: "Too confusing for me. Empire, Nords, Talos. Who cares? Just tell me who needs bludgeoning." If you ask his opinion on being a werewolf after becoming initiated within the ranks of the Circle, he will answer: "I like being stronger when I become the wolf. But Kodlak says it is bad for the soul, and I trust him." After you bring Aela her shield, she will eventually say: "Here, let's have Farkas show you where you'll be resting your head." Skjor will then shout after Farkas, who will come rushing into the room and participate in the conversation, with different dialogue depending on whether or not you met the Companions at Pelagia Farm. Farkas: "New blood? Oh, I remember you. Come on, follow me." OR "New blood? Oh, hello. I'm Farkas. Come on, follow me." When he walks you to the quarters for the new whelps, he will make the following comments: "Skjor and Aela like to tease me, but they're good people. They challenge us to be our best." "Nice to have a new face around. It gets boring here sometimes." "I hope we keep you. This can be a rough life." "The quarters are up here. Just pick a bed and fall in it when you're tired." "Tilma will keep the place clean. She always has." Once you both arrive at the whelps' quarters, he says: "Alright, so here you are. Looks like the others are eager to meet ya. Come to me or Aela if you're looking for work. Once you've made a bit of a name for yourself, Skjor and Vilkas might have things for you to do. Good luck. Welcome to the Companions. By the way, if you're looking for something to do..." This ends Take Up Arms and Farkas offers you one of his radiant quests. Skjor assigns you a mission to retrieve a fragment of Wuuthrad from Dustman's Cairn, and Farkas will act as your Shield-Brother and observer. He also tells you this will be your Trial, the final test for Companion membership. After speaking with Skjor, you will be directed to Farkas, who will state, "I hope you've readied yourself." When you ask if he will be your Shield-Brother, he responds with, "So I'm told. Let's see if you impress." Farkas will then become your follower, and any follower you have will be dismissed. What is Wuuthrad? "Ysgramor was the hero who started the Companions. Wuuthrad was his weapon. He came from the ancient homeland and killed all the elves. But not all of 'em, because some of 'em are still here." Why did Skjor call this my trial? "I watch you to make sure you're honorable. If you are honorable and strong, I can call you brother." Who was this scholar? "A smart man came and told us about a blade piece. Skjor thinks you should find it, and I'm supposed to watch you." Once you enter Dustman's Cairn, Farkas will comment, "Looks like someone's been digging here, and recently. Tread lightly." Further in, he will warn you. "Be careful around the burial stones. I don't want to haul you back to Jorrvaskr on my back." At some point, the Dragonborn will trap themselves behind a gate and trigger a cutscene. Farkas will come up to the gate and tease you with, "Now look what you've gotten yourself into. No worries, just sit tight. I'll find a release." then turn around with "What was that?" as five Silver Hand members enter the room. Soon Farkas is surrounded and being taunted. When one of the Silver Hand members states, "Killing you will make for an excellent story," Farkas responds with "None of you will be alive to tell it." He will then drop his sword and transform into a werewolf. After killing all the Silver Hand, he leaves the room to open the gate, then comes back in human form again and says, "I hope I didn't scare you." What was that? "It's a blessing given to some of us. We can be like wild beasts. Fearsome." You're going to make me a werewolf? "Oh, no. Only the Circle have the beastblood. Prove your honor to be a Companion. "Eyes on the prey, not the horizon." We should keep moving. Still the draugr to worry about." If you ask Farkas who the Silver Hand are, he will say, "Bad people who don't like werewolves. So they don't like us either." If you ask about the Companions being werewolves, he will explain, "Not everyone, but all the Circle are. It's a secret to everybody." Kodlak: "Brothers and Sisters of the Circle, today we welcome a new soul into our mortal fold. This man/woman has endured, has challenged and has showed his/her valor. Who will speak for him/her?" Farkas: "I stand witness for the courage of the soul before us." Kodlak: "Would you raise your shield in his/her defense?" Farkas: "I would stand at his/her back, that the world might never overtake us." Kodlak: "And would you raise your sword in his/her honor?" Farkas: "It stands ready to meet the blood of his/her foes." Kodlak: "And would you raise a mug in his/her name?" Farkas: "I would lead the song of triumph as our mead hall reveled in his/her stories." Kodlak: "Then this judgment of this Circle is complete. His/her heart beats with fury and courage that have united the Companions since the days of the distant green summers. Let it beat with ours, so the mountains may echo and our enemies may tremble at the call." Everyone: "It shall be so." During this quest, the remaining Circle members have a discussion in the Underforge about Kodlak's final wishes. Farkas only speaks once during this debate, stating, "Kodlak did not care for vengeance." The Circle eventually agrees to head to Ysgramor's Tomb to cure Kodlak's lycanthropy so he can ascend to Sovngarde. When you come across a spider den in the tomb, Farkas tells you, "I can't go any further, Shield-Brother/Sister." When you ask what is the matter, he admits, "Ever since Dustman's Cairn, the big crawly ones have been too much for me. Everyone has his weakness, and this one is mine. I'm not proud, but I will stay back with Vilkas. Give my regards to Ysgramor." He then leaves the Dragonborn and Aela to finish the quest on their own. After Glory of the Dead, the Dragonborn can speak to him again for more radiant quests. Eventually, he will offer the quests Purity and Dragon Seekers. Farkas means "wolf" in Hungarian. Farkas is in the faction GuardFaction (makes an actor a guard). This makes him chase you on sight when you have a high bounty in any given hold. 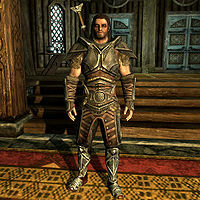 Farkas's class is "TrainerHeavyArmorMaster", which results in mismatches between his skills and his default equipment; for example, while his default weapon is a two-handed one, he is more proficient with one-handed weapons. This issue has been addressed by version 1.2 of the Unofficial Skyrim Patch; the class has had its skills changed to a basic duplicate of the CombatWarrior2H class, with an additional point in the Heavy Armor skill. Farkas is the only male member of the Circle who does not wear the Wolf Armor of the Companions. On occasion though, his armor will randomly change either after certain Companions quests or finding him as a random encounter in Skyrim. This issue has been addressed by version 1.2 of the Unofficial Skyrim Patch; his outfit was changed from Steel Armor to Wolf Armor. Farkas has an unused dialogue choice where he can be asked "What's it like being a werewolf?" and he would reply "I think there are some things that... oh, wait. Are you trying to trick me? You are not a full-blood yet. We can't talk about that." Farkas is initially armed with a Skyforge Steel Greatsword, but will lose it during Proving Honor. See that quest's page for details and a solution. Farkas may get stuck in an animation loop when he is supposed to guide you to the sleeping area of Jorrvaskr. Simply leave the living quarters and return. Sometimes after Glory of the Dead, Farkas will follow you and there is no speech option that lets you part ways with him. Sometimes Farkas follows you and initiates conversation repeatedly. If you are far enough in the Companions quest line, you can ask him to follow you and then tell him to part ways and he stops. After finishing the companions quest line, he or Vilkas may not have a dialog option to get work from them, thus making the purity quest impossible. This is usually not a bug it occurs when taking only one Glenmoril Witch's head during Blood's Honor quest. First acquire all or at least two for both Vilkas and Farkas the Glenmoril Witches heads (5 heads total) you can come back after Blood's Honor quest if you only picked up one to obtain the rest of the heads and after that head back to Jorrvaskr and speak to Farkas or Vilkas whoever didn't have quests to give and he or both will have the Purity quest complete it and both should give you their quests as normal.